Natural Crystal Nugget Beads - Large & Heavy! 30 Large 14mm Magical Crystal Beads - Heavy! 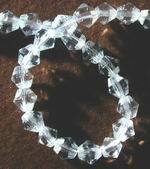 Ladies Magical Crystal Bracelet - Unusual!